January 2, 2015 January 3, 2015 - by Paul Farol - 10 Comments. We really don’t do food reviews on Get Real Post because we tend to vote with our wallets and if something is good, we’ll post about it on our own Facebook accounts or personal websites to endorse it to our real personal connections — not GRP’s main audience. But there are times when you come across food that looks great on the second screen and turns out to be one of the better food experiences in real life. That, in a nutshell, is my experience with Bai’s Boneless Lechon Cebu. 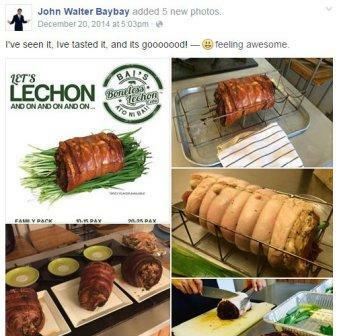 The first time I saw Bai’s Boneless Lechon Cebu was on fellow Christian, Business Consultant, and GRP writer John Baybay’s Facebook wall. I’ve seen a lot of lechon in my life but this one reminded me of all the savory memories of great tasting lechon I have ever had in my life. First, it has got to have great crackling. 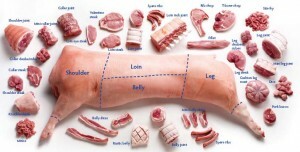 The skin or rind has to be crunchy and infused with a great deal of flavor. Second, it has to give off great aroma. It should have just the right balance between the sweet warm smell of roast pork and the spices that are put there to enhance the roasted pork’s natural aroma. Third is the taste, bite, and mouth-feel. Ideally, when I eat lechon, I usually get a slice that has a bit of skin and lots of meat with as little fat or sinew as possible because that ensures me that I can get the right mix of textures in one bite. Unfortunately, with a regular lechon, this is hardly possible all the time. Unless you get first dibs (which is very rare on most occasions), you can end up with a part of the whole pig roast that may not be the best cut at all. I don’t know how many times I just gave up my place in line for lechon at buffets after seeing that all of the loin or belly had been taken out already. The worst part you can get in a lechon usually is the leg or what is called pigue in Tagalog because that part tends to have the toughest meat as well as the least flavor. My least favorite cut of lechon is the shoulder or kasim, because it tends to have a lot of tendons as well as cartilage. It was on December 23 that John, JP Fenix, and I finally managed to get together to sample Bai’s Boneless Lechon Cebu… And it wasn’t really under the best of circumstances. You see, I had overestimated the time it would take me to reach Alabang from Marikina going through C5 and ended up being over an hour early for what was supposed to be a 10.30 appointment. Long story short, I unknowingly intruded into John’s gym time at Slimmer’s Festival Mall and decided to ride with him on his extremely well maintained Volvo to Bai’s kitchen where we picked up the pork — which, if I may add, John found by smell more than by sight. I wish I could have had a brief chat with Robert Dexter Ding when I met him at the stoop of his kitchen/house, if only to hear him tell me about his business’ backstory. But what’s a back story anyway? Most food find back stories really go they way of professionals or employees finding out that their hobby made for a great business. That kind of thing has simply been over done and someone should delete that template forever. 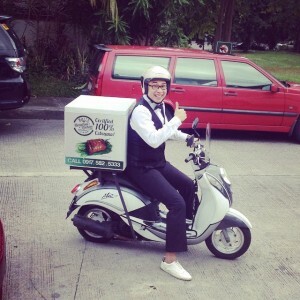 If I were to advise Robert here on a back story for Bai’s it would probably go the way of how super heroes discover or develop their super powers because the moment he handed me my box of Bai’s Boneless Lechon Cebu I could swear I saw it sparkle and gleam. 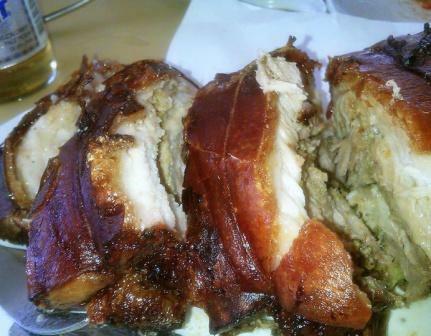 I immediately sensed the power in Bai’s Boneless Lechon Cebu. It was the smell of lemon grass, a hint of tarragon, freshly crushed pepper, perhaps some star anise, and other spices suffusing the delicious sweet smell of roasted pork that was coming out of the box that got me. And so John and I hauled our asses over to a nearby beer and barbecue place to sample it. As I mentioned at the start of this section, the day that we had chosen to sample Bai’s Boneless Lechon Cebu wasn’t under the best circumstances. It was overcast and windy, so by the time we got to the beer and barbecue place to sample the lechon, it had already cooled down significantly. Thing with most roasted pork is that when it cools down, a number of things happen. The crackling looses it crackle, the fat begins to render into the meat or coagulates into something that resemble hard lard, and the delicious roast pork aroma dies down a bit. But when we bit into our first roughly chopped morsels of Bai’s… the crackling cracked, the meat was firm and juicy, and the aroma somehow managed to come through despite the windy weather. So, with that, I’m endorsing Bai’s as a great food find, by my standards which I am told is near impeccable… So there! Find Bai’s Facebook Page here. Next Article 7M-peso 12-foot high wedding cake of Dingdong Dantes and Marian Rivera baffles the world! Looks like a diamond in a pile of gunk to me. Yum. I didn’t want to post an overly prettified picture of it the way other food bloggers would. So, my apologies if it doesn’t look at all appetizing, but I swear… it’s as good as it gets and then some. That’s actually right. So if people are curious, they just need to get there and eat. See for themselves. It would be more world famous if a lot more Filipinos actually took the time to prepare it and present it well and then promote it worldwide. Filipino cuisine is actually not that bad, if done well (and I’ve had my share of horror stories sampling local dishes which many foreign tourists had the misfortune of having). Fact is, there is great Filipino food to be had out there if you know where to look.